BANGI, 21 Oct, 2012 – A Neonatology Professor wants work in the area be stepped up as newborns still face many risks and complications including imbalanced nutrition and unconducive cultural practices. 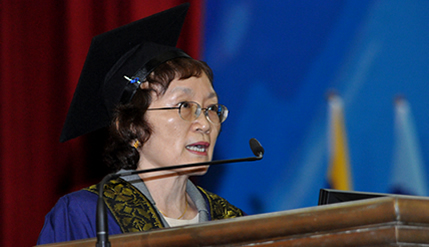 Prof Dr Boo New Yun, who has was conferred Professor Emerita at the third session of The National University of Malaysia (UKM) 40th Convocation today, suggested the disipline be encouraged. In an interview with UKM News Portal after her confirment, she expressed willingness to mentor specialists and researchers nationwide in efforts to reduce the incidence of infant deaths in the country. She said sophisticated and costly equipment alone are not enough to improve the chances of infant survivability. Neonatology is a sub-specialisation of pediatrics related to treatment for new born babies, especially premature babies and those born with illness and complications. She wants to reduce complications linked to premature babies including eye problems, lung infectiions and brain development and expressed gratitude for the opportunity to help neonatologists rise to the challenge. She said new methods of treatments needed to be administered to deal with problems faced by premature babies pertaining to their eyes, lungs and brain so that they can lead close to a normal life. This, however, require dedicated workers in neonatology who are still in short supply. She and her colleagues have been meeting three times a year to discuss their experiences and update their databases on such incidence. Prof Boo, with her over 30 years of experience in the field, is prepared to help guide the younger professionals who venture into the field hoping that more doctors will specialise in it. She said UKM’s Faculty of Medicine and the Neonatal Intensive Care Unit (NICU) at the UKM Medical Centre are playing vital roles in the care of new-born infants especially those born prematurely. She described NICU as the best place for neonatologists to work, teach and do research. Prof Boo said UKM has emerged as a leader in the field through high quality services, mentorship, research and cooperation within the neonatology community in Malaysia and through out the world. As an example UKM was the first in the country to have NICU wards which used the “high frequency oscillator” ventilation treatment for premature babies. UKM also pioneered brain-scanning of newborns using ultra-sound, took part in neonatal networkings (the Vermont Oxford Network) and generally helped improved neonatal treatment in a systematic manner. She cited figures showing iprovement of the situation in the country where infant mortality rate had dropped from 15 for every 1,000 births 30 years ago to three for every 1,000 births now. UKM also uses the “Kangaroo Care” treatment for babies’ development by setting up itensive neonatal care ward which encourages babies warded there to develop within the environment and together with their families. Prof Boo has served as Chairman of the Malaysian National Neonatal Resusitation Programme in from1996 until 2012. The programme has in the last 16 years trained more than 20,000 doctors and nurses in neonatal care. She is now Senior Profesor at the Faculty of Medicine and Health Sciences at Universiti Tunku Abdul Rahman.